1) This paper is based on the keynote presentation of Warwick Watkins, Surveyor General of New South Wales, to be presented at the 2nd plenary session on Spatially Enabled Society at the FIG Congress 2010 in Sydney. The article gives an introduction to the advanced conceptual approach to SDI as used by the Land and Property Management Authority in New South Wales, Australia. This approach will be further elaborated by Warrick Watkins at the FIG Congress. Participants who are interested in gaining an indepth, practical training on how to spatially enable LI in their jurisdictions should register for technical tour to LPMA. The article has been jointly authored by Warwick Watkins and Pedro Harris and is based on a doctoral research thesis by Pedro Harris. The research study was sponsored by the Land and Property Management Authority, NSW, Australia. Governments worldwide are reviewing how they deliver services in the middle of a global financial crisis. With budgets under pressure and a shortage of investment funds there is a greater need for sharing data, systems and infrastructure. Increasingly, there is also a need for more informed decision-making at all levels. To remain competitive in this environment requires decision-makers at all levels to be informed with the best available and most current information. Not surprisingly, there is a growing demand for location-based analytics in the decision-making process. This is more commonly being termed as Location Intelligence (LI). This concept builds on the history and practice of measurement, position and time, the core elements and underpinnings of surveying and the understanding and application of information technology. It is the fundamentals of surveying, the elements of information technology, and the synergies between these two disciplines that have forged the core elements of spatial information and LI as we know it today. 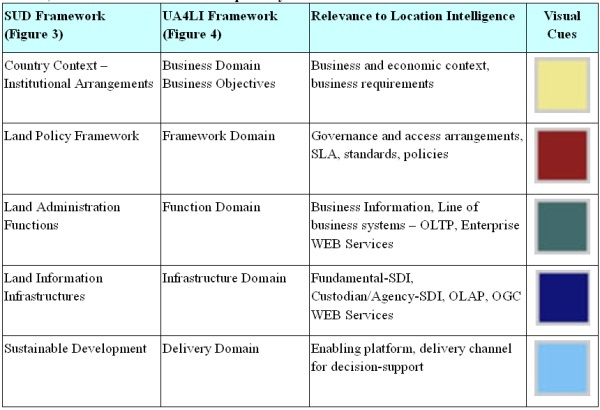 This paper addresses the issue of accelerating the adoption of spatially enabling LI through a multi-disciplinary systems-theory framework approach to unify business, information and technology architectures for the delivery of location-based information. The Unified Architecture for Location Intelligence (UA4LI) was the key deliverable from a doctoral dissertation, sponsored by the Land and Property Management Authority, to address adoption issues of this emerging paradigm in New South Wales (Harris, 2010). The genesis of the UA4LI can be traced to the Enemark's Sustainable Urban Development (SUD) framework, designed to address informal land use and bring about sustainable development. 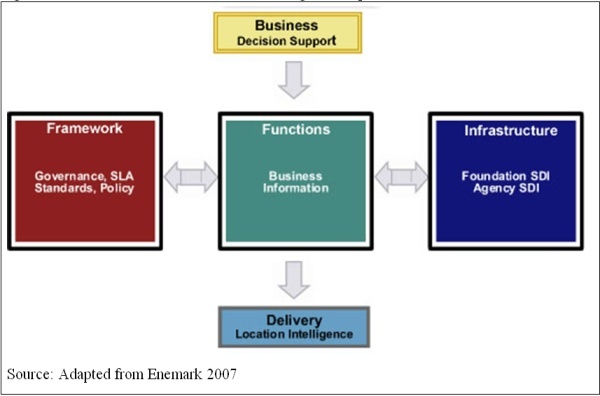 Another feature is that the SUD framework has strong alignment with spatial data infrastructures, on the one hand, and on the other draws upon business information which are both common features of LI (Enemark, 2005, 2007). In the February, 2010 FIG Newsletter, Jude Wallace commented on how land administration theory is being further developed as a multi-disciplinary approach to deal with other emerging challenges associated with sustainable development and challenges such as equitable land acquisition principles (Wallace, 2010). Wallace’s article draws on Enemark's pioneering work first introduced in 2004. Enemark devised the new framework for dealing with sustainable urban development, herein referred to as the SUD framework (Enemark, 2004). This paper, however, discusses how the SUD framework was extended and used to develop the UA4LI framework in support of LI developments. The UA4LI framework is not restricted to land-use and land-management related areas and can be used in other disciplines such as banking, insurance, emergency management, recreation, and transport as well as in government service delivery. The universality of this framework is testament to the rigour of the underpinning research work of Enemark, Wallace, Rajabifard, Williamson et al. It is further evidence of the deep roots the discipline of surveying and the professional application of the knowledge, dedication and relevance of the profession has to offer to a world that is beset with so many challenges. Governments worldwide are reviewing how they deliver services in the middle of a global financial crisis following the earlier collapse of the USA’s subprime mortgage market. The current economic crisis has brought with it a renewed sense of survival for organisations (Shiller, 2008). While governments are not immune from the financial crisis they are constantly on the lookout for ways to improve services and reduce cost. With budgets under pressure, the need for sharing data, systems, infrastructure and ideas have become critical (Butler Group, 2009a; Rees, 2009). Public and private sector organisations acting in a unilateral manner will not be able to survive and would need to operate in partnership arrangements (Shiller, 2008). Sharing information infrastructure and utilising common platforms and frameworks are some of the contemporary approaches being considered for improved service delivery. The New South Wales State Plan outlined one of its key priorities for improving service delivery by focusing on “increased customer satisfaction with Government services” and by making current information available to citizens over the Web and to the public service (NSW_Government, 2006, p. 30). This implies that citizens and staff alike should have unfettered and equitable access to information at all levels. Citizens want modern and efficient government services (NSW_Government, 2006). They are becoming IT savvy and are increasingly demanding new e-government services. This phenomenon is being referred to as Gov 2.0. At its core is a need for greater levels of transparency and access to government information. To tackle these information management challenges and structural reforms head on, requires greater reliance of shared infrastructure, shared services and access to current information. These tenets are also important criterion for land-administration systems. Unsurprisingly, it has meant that governments are redefining their service delivery in the market space. To remain relevant in this environment requires decision-makers at all levels to be informed with the best available and most current information, which is often hard to locate and access (Butler Group, 2009; Shiller, 2008; Williamson, Rajabifard, & Binns, 2007). According to Lee and Percival (2008), between 80 to 90 percent of all information has a spatial dimension and is spatially related to some point such as an address, GPS coordinates, location, post code and landmarks. This new reality is the fuel behind the current technology explosion for maps and being able to ‘mash up’ in real-time real-world objects and to augment it with information held elsewhere. This ‘augmented reality’ is essentially about being informed with the latest information anywhere and anytime. LI works by being able to view business information together with location information to understand what impact different situations and scenarios will have on a business. It provides a spatial context to business information by geo-referencing it and encapsulating it with a geographical information system (Lee & Percivall, 2008). To have this capability operating at different management levels and across business divisions requires access to fundamental spatial data infrastructure, business information and enabling IT platforms. LI involves processes and technologies to improve an organisation’s effectiveness by integrating business and location-based information within an environment of a governing framework and being delivered using the Web 2.0 technology. LI is seen as an important tool that should be used by management and operational staff at all levels. Visualising business and location information graphically in a composite application can achieve far much more than descriptive text alone – a picture paints a thousand words (source anon). Applications such as Google Maps, Bing Maps and Sensis Whereis are used at home and in businesses to locate addresses, get directions on how to get to places, view aerial photography to see what the place looks like beforehand and to determine landmarks and other characteristics of the surroundings. Overlay business information with location information and it becomes a powerful tool. Thus being able to collaborate with people, information, maps and computer systems in real-time has many benefits but also has some risks. There have been a growing number of successful LI implementations but as the concept is still relatively new and not well understood, the full benefits of it will not be realised until the concept becomes mainstream. To have LI operating at a whole-of-government or at a multi-enterprise scale requires a strategic approach with supporting policies, frameworks and access to shared spatial services. Case studies in NSW, Australia have shown how adoption rates are accelerated when there are service platforms and enabling frameworks. The use of Internet applications has become pervasive but they are designed primarily for mass consumer markets based on a paid advertising model. These relatively new Internet applications are identified as second generation geographical information system (GIS) technology where the focus is on consumerism. The first generation of GIS was limited to expert users such as GIS analysts. Even with the advances of second generation GIS, primarily made available over the Internet, there are limitations with these applications in a business setting. Data custodians are wary about publishing data to the Internet because of security concerns, cyber fraud and identity theft issues. Thus a third wave is emerging where governments and large businesses are investing in similar technology platforms for use within their enterprises. These emerging third generation Web 2.0 applications embrace Internet technology but operate in secure Virtual Private Networks. Subscribers can publish their data and retain ownership over the content without the fear of it being repurposed and on-sold without their consent. Figure 1 provides a summary of the three communities of users, namely: citizen, business and expert. The diagram depicts the present environment showing all three tranches in operation. GIS Tranche-3 represents the current paradigm where the business community is the emerging group making demands for the GIS software. LI is seen as a GIS Tranche-3 development. In GIS Tranche-1 the market space was occupied, almost exclusively, by the scientific community and expert analysts. With GIS Tranche-2 came millions of users who became interested in Internet mapping applications developed by companies such as Google, Telstra and Microsoft. LI is continuing to evolve and is being integrated directly into many applications using Web 2.0 technology in a business setting (Sheina, 2009). Business communities have been locked in between these two extremes, not needing raw data but requiring information that has been optimised for their business needs to support decision-making. Table 1 provides a summary of the three tranches, a market indicator, user defined groups, technology users and applications uses. All three tranches are in operation today and are at different levels of maturity – see market status column in Table 1. Provision of government spatial services to mobile users – for infield workers such as Fire Fighters, Surveyors, Accredited Valuers, Police and other mobile staff. 1.4 Why Web 2.0 and Gov 2.0? The advent of Web 2.0 and maturity of web services and standards are changing the way organisations work. This has brought a raft of new technology and concepts to the market place in a very short space. The IT landscape is now awash with new concepts such as cloud computing, social networking, crowd-sourcing and spatial “geo-hubs” which are impacting on the way organisations work and operate (Huberman, 2008). Gov 2.0 is a worldwide movement using Web 2.0 technology in a bid to redefine government using social networking as a medium to discover what citizens want from government. Various governments have formed task forces to deal with this. In NSW, this movement has been spearheaded as NSWsphere (Sharpe, 2009). The central tenet of this new wave of technology is on collaboration and hence its use in defining “e-democracy”. Collaboration involves people interacting, in real-time, with people and businesses wherever they are and using any connected device they have access to such as a mobile phone, personal digital assistance (PDA), laptop or television set. Similarly, computers collaborate and share services and data using the same underlying technology. This same technology has been used to deliver new GIS solutions and increasingly for decision-support applications. The pressures of building and maintaining a sustainable business involves a process of continual improvement, adapting to new circumstances and ensuring staff have the necessary skills, tools, information and systems. Increasingly, LI is being considered as a mandatory and fundamental management tool. Current and accurate information is recognised as a key ingredient for decision support systems (Williamson, et al., 2007). New market economies are being developed around subscription based content and increasingly the demand for the best-available spatial information will increase. 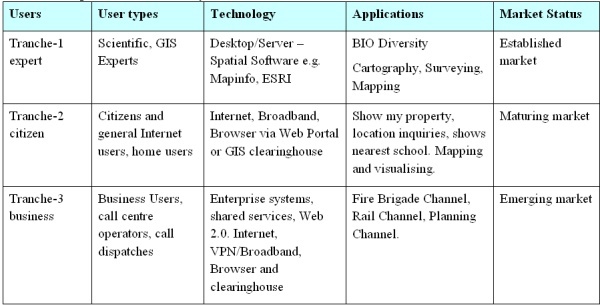 These challenges and technology shifts are most currently observable in the spatial industry with the convergence of location-based services (LBS); with integration in mobile computing devices such as mobile phones and PDA devices; with GIS applications such as Google Maps and in-vehicle navigation systems. When the combined worth of the industry is considered as a whole with LBS companies such as TomTom International, Magellan, Garmin and Nokia to name a few, together with satellite and global positioning networks, and GIS application software vendors such as Google, Microsoft, ESRI, Leica and MapInfo, it is a staggering sum (Vaughan-Nichols, February 2009). It serves to highlight the significant developmental changes that are occurring within this industry and specifically for the GIS Tranche-2 and 3 environments. The Australian Cooperative Research Centre for Spatial Information (CRCSI) and the Australian and New Zealand Land Information Council (ANZLIC) commissioned ACIL Tasman in 2007 to conduct an independent quantifiable analysis of the value of spatial information to the Australian economy in the 2006-07 financial year (ACIL-Tasman, 2008). The CRCSI report found that spatial information industry revenue in 2006/07 was around $1.37 billion annually and contributed a cumulative gain of between $6.43 billion to $12.57 billion dollars in GDP (ACIL-Tasman, 2008). Spatial information by itself has little intrinsic value but the value is increased when it is used (Cutler, 2008). Hence, the value of spatial information is derived from its contribution to the decision-making process (ACIL-Tasman, 2008, 2009; Longhorn & Blakemore, 2008; Masser, 2007). The CRCSI report also highlighted that the lack of access to spatial information has constrained direct productivity impacts on consumption of GDP by at least $0.5 billion than might otherwise have been realised (ACIL-Tasman, 2008). Despite the economic losses due to limitations of access to spatial information the study highlighted the potential trend where “the contribution of spatial information is likely to increase as spatial information becomes a mainstream enterprise resource”(ACIL-Tasman, 2008, p.xii). Data access – technologies and systems to provide simple and effective access, developing consistency between data access portals. Besides, there are a range of other intangible benefits such as its role in security, biosecurity, national mapping, environment, climate change and land and property registers (ACIL-Tasman, 2008; Tang & Selwood, 2005; Williamson, et al., 2007). Location-based analytics is a mechanism that can be used in support of these functions. Tang and Selwood (2005, p.3) support the idea that “Better, faster access to information leads to better-informed decisions and actions”. Thus, UA4LI is about facilitating access to spatial information as a mainstream resource. The Australian Government Information Management Office (AGIMO 2007) argues that the “impetus for business process interoperability stems from the increasing need for collaboration within and between agencies in the delivery of services” (p.13). The corollary holds true for spatial interoperability where there is a need to share spatial information for improved service delivery. Drivers of spatial interoperability include responding to increasingly complex social and environmental problems requiring access to a range of data. Hence, spatial data interoperability is about providing access to core fundamental spatial data layers to better informed and more discriminating customers (ACIL-Tasman, 2008). Despite the positive gains in recent years in spatial technology, interoperability is still impeded by lack of infrastructure and archaic access restrictions (Budhathoki & Nedovic-Budic, 2007). The term “Spatial Data Infrastructure” (SDI) is often used to denote the relevant base collection of geographic technologies, policies and institutional arrangements that facilitate the availability of, and access to spatial information (GSDI, 2004, 2008). In NSW, the concept of an SDI is the geographic information technology component of e-government, and therefore there us a strong reliance on government actively supplying core framework data (Onsrud, 2007). SDIs provide the “basis for spatial data discovery, evaluation, and application for users and providers within all levels of government, the commercial sector, the non-profit sector, academia and by citizens in general” (GSDI 2004, p. 8). 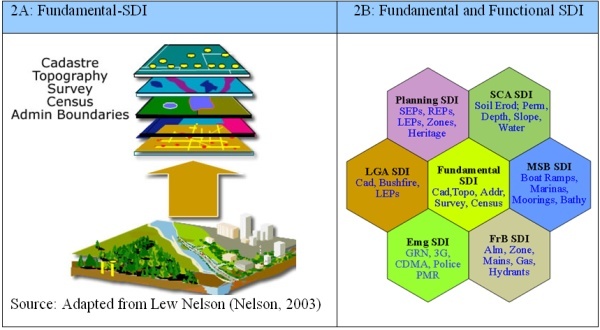 SDIs found in developed nations are comprised of several elements such as: metadata, geographic data, framework data (cadastre and topography), standards and services (GSDI, 2008). This can be seen illustrated in Figure 2. The SDI is comprised of the fundamental-SDI layers as shown in Figure 2 (column 2A) and other functional geographic data such as planning, emergency management, maritime and so forth. Figure 2 provides an illustration of the fundamental-SDI and composite functional-SDIs. Spatial information is impeded by both “soft” interoperability and “hard” interoperability. Soft interoperability deals with non-functional and non-technical limitations imposed by people through their unwillingness to share, licensing restrictions and pricing regimes. Hard interoperability, on the other hand, deals with infrastructure, technical limitations, data quality issues, data currency and up-to-date metadata (Budhathoki & Nedovic-Budic, 2007). Omran, Breght et al (2007) are of the view that personal factors may affect individual decisions to share spatial data and cites psychological responses such as attitudes, experience, empathy, fatalism, motivation, trust and ability to cope with uncertainties as some of the barriers to overcome. Omran, Breght et al (2007) commented that organisational resistance to share spatial data is a real obstacle to exploiting spatial data infrastructures. In the past it was the technology or lack of technical capacity that impeded access to spatial data infrastructures but now the problem seems to have shifted from hard interoperability concerns to soft interoperability issues (ACIL-Tasman, 2008; Omran, Bregt, & Compvoets, 2007). Very rarely do all geospatial datasets reside in one organisation and hence cooperation and data sharing amongst organisations have become essential (McDougall, Rajabifard, & Williamson, 2007). Traditional data sharing arrangements have involved the physical transfer of data files and in order to reduce data duplication, spatial data sharing (SDS) over the Web is considered essential (Omran, et al., 2007). Thus, with advances in communication technology, data sharing is now possible via a remote connection over the Internet, and this obviates the need for conventional file transfers. Location-based analytic requirements are determined when a single item of data may be used in many different ways, a theme commonly shared with the SUD theory. The SUD Framework was designed as a universal framework to address land-management and land-use issues. The SUD Framework recognises that each country will have its own land management issues, administration idiosyncrasies, differing legal frameworks and land registry systems and yet still provides the flexibility for a generic model (Williamson, Enemark, Wallace, & Rajabifard, 2010). Each country has its own land administration systems for implementation of its land-related policies and land-management strategies thus providing a country’s infrastructure for economic development (Williamson, Enemark, Wallace, & Rajabifard, 2008). The model works within a jurisdiction or country context, or Spatial Data Infrastructure (SDI) “zone”, which sets the political and legal framework (Cho, 2005). Enemark (2007) found that the SUD Framework operates best within a jurisdiction, a country context or “SDI zone” which sets the political and legal framework. This is illustrated in the country context frame and includes such things as business requirements and problem identification and sets out what needs to be accomplished. 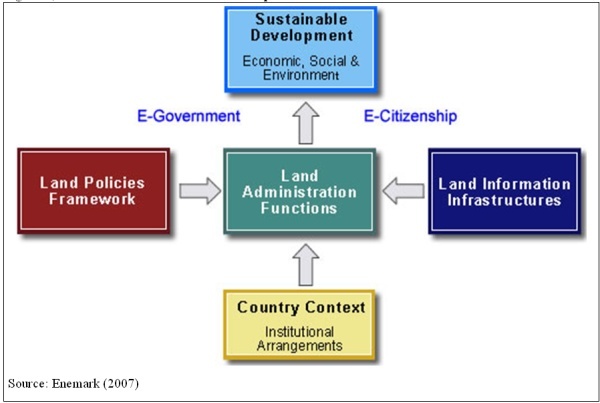 Having identified the country context the model then operates by bringing together the process information made up of the policy framework, land-functions and land-infrastructure. The various data sources provide information to tackle economic, social and environmental issues around land management and land use. Figure 3 provides an outline of the components of the SUD Framework (Enemark, 2007). The framework for political decision-making should therefore be organised to facilitate an integrated approach to land-use management that combines the three areas of land policies, land information management, and land-use management. (Enemark 2007, p. 1). The SUD Framework is an amalgam of land and property rights, restrictions and obligations drawn together seamlessly with data from functional line-of-business systems, spatial infrastructure systems and facilitated within a governance framework (Enemark, 2007, 2008; Williamson, et al., 2007). In Figure 4 the model for LI is inverted to direct the flow from top to bottom rather than the inverse which is the case with the SUD Framework. The rationale for this change is twofold. Firstly, writing in English generally flows from top to bottom, left to right. 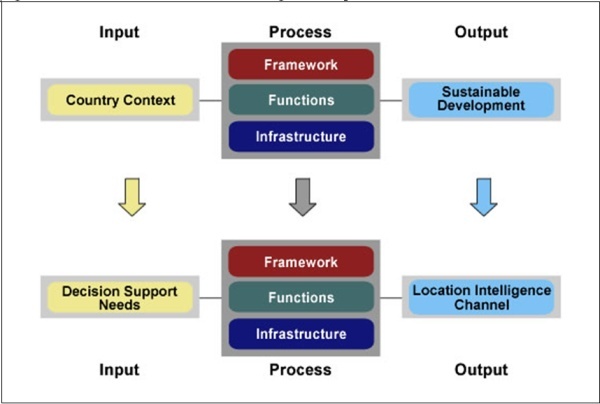 By placing the Business (Context) at the top, this provides readers with the sense of the desired flow – LI starts with business need, then it is processed by ingesting the framework, functions and infrastructure requirement and the output is the delivery solution for the LI channel. Secondly, the Unified Architecture is designed as a process model embracing three distinct phases of input-process-output (IPO). In business modelling, the process flow diagrams start at the top and work their way to the bottom. Thus the reason for inverting the business context diagram as shown in Figure 4. The adapted model places far more importance on the Business Context, the starting point, rather than the Delivery Platform, the solution. The other changes are the directional flow arrows of the process boxes. The SUD Framework shows the process flows converging on Functions while in contrast the arrows are bi-directional with the UA4LI Framework. The cross domain involvement can be seen illustrated in the following examples. Example: security requirements (being an element of the Framework domain) can extend across all domains. A Framework domain element for security such as an Information Security Management System (ISMS) provides overarching statements of applicability for the other domains. Conversely, an Infrastructure domain web service requires security instructions for a service bind and therefore needs to relate to the Framework domain. A Function domain exposing a line-of-business service may require packet encryption which is dictated by the Framework domain. These examples show how a domain can interact with another domain. However, the SUD Framework does not make this distinction with its direction flows. The models are at different scales – one at a high/conceptual level as compared with a business/logical level. At a conceptual level the directional flows of the SUD Framework are linear leading to the desired outcome at a national or country context. The LI Framework is more focused on a Business context and the interactions are at a more granular level and hence the process flows are bi-directional dealing more with the solution delivery input and outputs. Delivery domain is about the platforms that underpin the delivery of the solution, the systems components, the technical environments, enterprise platforms, service platforms, integrated framework, enterprise service and message bus and portal delivery systems, typically “hard” issues. 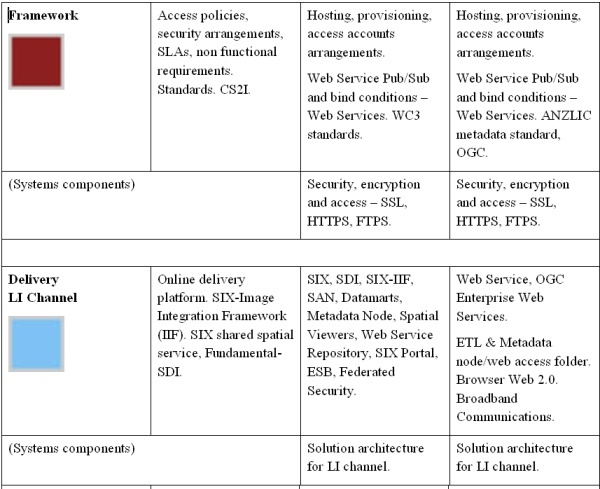 Table 2 shows how each of the LI domain components map and relate to the SUD Framework with matching visual cues for each domain. The delivery domain is concerned with the product outcome. It deals with the technical platforms and solution architecture that are needed to deliver the information to the decision-makers. Invariably many of the data sources required to support the SUD process come from several data custodians and could be in varying forms. Some custodians offer web services and others may only provide the data on tape or on portable mass-storage devices to fulfil the requirements. The raw data may have to be post-processed into a format so that it can be used in the SUD solution. The framework domain caters for non-functional requirements, governance arrangements, legislation, service level agreements, security, policies, standards and typically “soft” interoperability issues. It includes issues such as privacy considerations, data access and permission rights, governance, licensing, restrictions, pricing and imposed digital rights. It establishes the authorising environment to bring about SUD outcomes. The functions domain focuses on the transactional data held in land-registers and other line-of-business systems such as valuations and titling information. These are typically business systems or land-administration systems (Williamson, et al., 2008). Methods of access to this data vary and are far more sensitive than spatial data. Contemporary methods involve secure web services for online transaction processing systems (OLTP). Functional data can be obtained with web services on a transaction by transaction basis. Business objects described as web services can provide answers to queries without supplying the full dataset. The infrastructure domain is concerned primarily with spatial data infrastructure such as cadastral data, topographic data, aerial or satellite photography and other spatial data sets. The SUD framework draws heavily on fundamental spatial data infrastructure held by mapping and land-administration organisations. It also includes other functional spatial data from natural resource and local government authorities. The authoritative data from these organisations provide many of the base “fundamental SDI” layers (Akinyemi, 2007). The business domain addresses the business imperatives and context for the SUD framework. It deals with innovation, economic drivers, environmental impacts, political and policy outcomes. The key drivers of the business domain are to inform political decision-making and to provide an integrated approach to land-management, land-information and land-use (Enemark, 2007; Williamson, et al., 2008). The UA4LI Framework is comprised of a “Four Step” process to assist with implementing location intelligence solutions. At the conclusion of Step 4 an organisation wishing to implement an LI solution would be able to evaluate the requirements and make an informed decision about proceeding. The Framework leads to the delivery of solution architecture blueprints for an LI implementation. Starting with Step 1, each “step” builds on the other, identifies stakeholder involvement, provides an overview and description of what is expected, a context diagram and a deliverable output. Drawing on the collective outputs from each step the goal is to describe the LI solution architecture and delivery environment. Figure 5 is presented as a pyramid or iceberg where there is more detailed information at the base than at the top. Each step has a deliverable; this can be seen on the vertical plain: channel description, process model, systems model and components model. Each step is comprised of five domains represented in the SUD Framework in colour on the horizontal axis and includes: business, infrastructure, functions, framework and delivery. Step 1 is at a high level and Step 4 contains more detail. Step 1 is to provide a high level description of the business objectives and sets the overall context. The deliverable output is a Channel Description document. The Channel Description deliverable contains summary details, at a high level, of stakeholder information and descriptive narratives of each of the five domains. Step 2 is focused on the business processes and information perspectives needed to inform decision makers. The deliverable output is a Process Model that includes an inventory of business use cases, information requirements, business objects and target systems where source data resides. Step 3 is focused on the systems processes and data perspectives needed to describe the solutions architecture and service platforms. The deliverable output is a Systems Model that bridges and links systems requirements to the business deliverables gathered in earlier steps. The deliverable includes a systems use case inventory and descriptions of web and enterprise services. Step 4 provides a unified detailed description of the business and systems requirements. The deliverable output is a decomposed Components Model of the LI solution. Components are described for the presentation, services and data integration layers. When aligning the UA4LI Framework to the SUD Framework traces of all domains can be found. This is seen illustrated in Table 3. 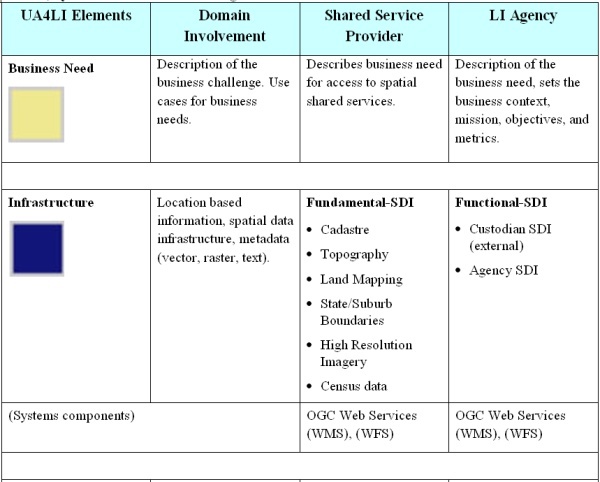 The ‘UA4LI Elements’ column describes the domain names; ‘Business Context’ gives a description about the domain; ‘Shared Service’ describes the spatial shared service; and Agency/Business describes the Agency and/or other party data. The UA4LI Framework is designed to take in the business and information requirements which are used to develop the systems requirements. Next, the solution architecture is produced for delivering the information via the online LI channel. The UA4LI systems components provide the basis for the solution architecture of the service platform. The Systems Model deliverable describes responsibilities of the Agency/Business and distinguishes between the roles of shared service provider. As identified above, the Enemark SUD Framework provides a framework for addressing land-management and land-use issues. It describes universal problems faced by many nations in terms of managing land resources and creating sustainable environments. The SUD Framework is aimed at equipping governments and societies with information to better manage their land resources. The outcome is certainly geared toward better decision making and for making informed choices about the environment. As a corollary, the Location Intelligence paradigm aims at aiding decision making and to arm managers and operational staff with better information. The changes between the two frameworks can be observed in Figure 7. The major change differences are shifts from the macro level to a micro level; from country to business and from outcome to output. The Country Context is changed to become the Business Context and the Sustainable Development outcome is changed to be the LI Delivery Channel. Location Intelligence, as previously defined, is the art of leveraging unified location information for business intelligence. The purpose behind Location Intelligence (LI) is to be able to view business information together with location information and understand what impact different situations and scenarios will have on an organisation. A LI Channel can be developed to support the objectives of the SUD framework. Location Intelligence (LI) extends traditional Business Intelligence (BI) through the use of GIS technology by integrating business information with location data and encapsulates the use of geographical information in decision-making at all levels. It involves processes and technologies to improve an organisation’s effectiveness by arranging available business and location information and relating it to fundamental Spatial Data Infrastructure. The commonalities between the systems components of LI and SUD Framework are similar in many ways. Firstly, the Fundamental-SDI components are the same. Secondly, the Enterprise Web services are the same, with both providing access to business function data. Thirdly, the framework elements are similar in terms of governance, access arrangements, security and non-functional requirements. These similarities provided a strong basis for adapting the Enemark SUD Framework into a generic unified framework for Location Intelligence. This work highlights the interdependences between the fundamental principles of surveying, namely measurement and position, and the empowerment that technology has given to the interpretation and application of the SDI elements that are inextricably linked to position. It also demonstrates the need for these to be seen through the eyes of business decision-making and problem-solving to achieve the social wellbeing of all citizens, and the attainment of sustainable communities, environmental conservation and economic development. ACIL-Tasman (2008). The Value of Spatial Information: The impact of modern spatial information technologies on the Australian economy. Melbourne: Prepared for the CRC for Spatial Information & ANZLIC – the Spatial Information Council. ACIL-Tasman (2009). Spatial information in the New Zealand economy: Realising productivity gains. Melbourne: Prepared for Land Information New Zealand; Department of Conservation; Ministry of Economic Development. Akinyemi, F. O. (2007). Spatial Data Needs for Poverty Management. In H. Onsrud (Ed. ), Research and Theory in Advancing Spatial Data Infrastructure Concepts (pp. 33-54). Redlands, CA: ESRI Press. Budhathoki, N. R., & Nedovic-Budic, Z. (2007). Expanding the Spatial Data Infrastructure Knowledge Base. In H. Onsrud (Ed. ), Research and Theory in Advancing Spatial Data Infrastructure Concepts (pp. 7-31). Redlands, CA: ESRI Press. Cho, G. (2005). Geographic Information Science: Mastering Legal Issues. Milton, QLD: John Wiley & Sons. Cutler, T. (2008). Venturous Australia, building strength in innovation. Canberra. Enemark, S. (2005). Supporting Capacity Development for Sustainable Land Administration Infrastructures. Paper presented at the The Eighth United Nations Regional Cartographic Conference for The Americas (UNRCCA), New York. GSDI (2004). Developing Spatial Data Infrastructures. In D. Nebert (Ed. ), The SDI Cookbook (Vol. 2): GSDI Association. Harris, P. (2010). Unified Architecture Framework for Location Intelligence. Charles Sturt University, Bathurst. Huberman, B. A. (2008). Crowdsourcing and Attention. Computer Innovation Technology for Computer Professionals, IEEE Computer Society, 103-105. Lee, C., & Percivall, G. (2008). Standards-Based Computing Capabilities for Distributed Geospatial Applications. Computer Innovation Technology for Computer Professionals, IEEE Computer Society, 50-57. Longhorn, R. A., & Blakemore, M. (2008). Geographic Information: Value, Pricing, Production, and Consumption. Boca Raton: CRC Press. Masser, I. (2007). Building European Spatial Data Infrastructures. Redlands, CA: ESRI Press. McDougall, K., Rajabifard, A., & Williamson, I. p. (2007). A Mixed-Method Approach for Evaluating Spatial Data Sharing Partnerships for Spatial Data Infrastructure. In H. Onsrud (Ed. ), Research and Theory in Advancing Spatial Data Infrastructure Concepts (pp. 33-54). Redlands, CA: ESRI Press. Nelson, L. (2003). Data Model for Law Enforcement. Redlands: ESRI Press. NSW_Government (2006). A new direction for NSW: STATE PLAN SUMMARY. Retrieved 01/09/2008. from http://www.nsw.gov.au/stateplan/pdf/Summary_complete.pdf. Omran, E.-S. E., Bregt, A., & Compvoets, J. (2007). Spatial Data Sharing: A Cross Cultural Concept Model. In H. Onsrud (Ed. ), Research and Theory in Advancing Spatial Data Infrastructure Concepts (pp. 33-54). Redlands, CA: ESRI Press. Onsrud, H. (Ed.). (2007). Research and Theory in Advancing Spatial Data Infrastructure Concepts. Redlands, CA: ESRI Press. Shiller, R. J. (2008). The Subprime Solution: How Today's Global Financial Crisis Happened, and What to Do about It. Princeton: Princeton University Press. Tang, W., & Selwood, J. (2005). Spatial Portals: Gateways to Geographic Information. Redlands, CA: ESRI Press. Vaughan-Nichols, S. J. (February 2009). Will Mobile Computing's Future Be Location, Location, Location. Computer Innovation Technology for Computer Professionals, IEEE Computer Society, 14-17. Williamson, I., Enemark, S., Wallace, J., & Rajabifard, A. (2010). Land Administration for Sustainable Development. Redlands: ESRI Press Academic. Williamson, I., Rajabifard, A., & Binns, A. (2007). The Role of Spatial Data Infrastructures in Establishing an Enabling Platform for Decision Making in Australia. In H. Onsrud (Ed. ), Research and Theory in Advancing Spatial Data Infrastructure Concepts (pp. 121-132). Redlands, CA: ESRI Press. The Land and Property Management Authority (LPMA) consists of Land and Property Information (LPI) - titling, valuation, surveying, and other spatial information; Crown Lands administration and management - land leases and licences, reserves and State Parks and land uses from cemeteries to iconic development/business sites to tourist and recreation areas; Native Title and Aboriginal Land Claims; Soil Conservation Service - including soil conservation earthworks and consultancy services, Land Boards and the Emergency Information Coordination Unit - spatial data needs for counter terrorism and emergency services planning, research and consequence management, the Office of Rural Affairs and the Office of Biofuels, the State Property Authority, Hunter Development Corporation, Festival Development Corporation and the Lake Illawarra Authority. Warwick Watkins AM, is the Chief Executive Officer of the NSW Land and Property Management Authority. Warwick graduated from Hawkesbury Agricultural College at Richmond, now part of the University of Western Sydney with Honours (HDA, Hons) and gained further postgraduate degrees and diplomas from the University of New England in Armidale, including a Masters Degree in Natural Resources (MNatRes, DipSciAgr). He also studied at the Harvard Business School in Boston in the United States of America (AMP:ISMP). Dr. Pedro Harris, the Chief Information and Technology Officer (CITO) of the NSW Land and Property Management Authority. Pedro holds a Doctor of Business Administration (DBA) from Charles Sturt University, and a Master of Public Administration (MPA) from Monash University.